Contemporary internet users grasp information better via images and the so-called clip thinking, so we’ve decided to prepare an official part of our material (the Wikipedia information) in the form of screenshots. Ahura Mazda, Ohrmazd or Hurmuz – the Lord of Wisdom – is the Avestan name of the deity as proclaimed by Prophet Zarathustra (Zoroaster). Ahura Mazda is the father of Asha (truth) – the law by which the world develops. He is the patron of pious people and the leader of the forces of good that fight against falsehood. His creative power that fills existence with vital energy is described as Spenta Mainyu, which is usually translated as the Holy Spirit (!!!). 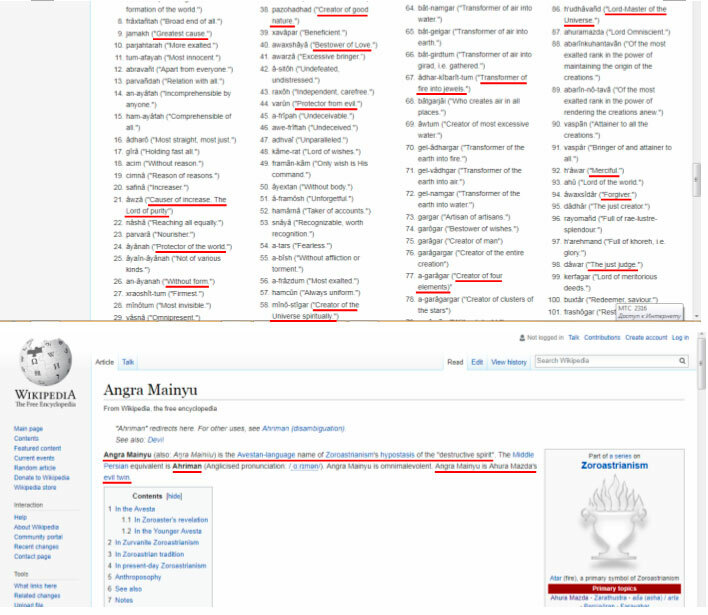 Spenta Mainyu (the Holy Spirit) opposes Angra Mainyu or Ahriman / Ariman (also known by such names as Abraxas, Satan, etc.). Ahura corresponds to the Sanskrit असुर (asura) – the epithet of many deities in the Rigveda, above all Varuna. Ahura Mazda revealed himself to Prophet Zarathustra after long years of persistent spiritual searching. Ahura Mazda is proclaimed the greatest of all. His goodness is absolute. He is the most powerful, the most informed and knowledgeable about the past and the future. He always follows the direct way of righteousness. He is in the closest relations with humanity. Anyone who’s on his side can feel oneself close to Him as to a friend, brother or father. He is benevolent to everyone who strives for friendship with Him. Ahura Mazda is the Lord of Justice (!). His manifestation in this world is associated with the destruction of evil (Druj) and the approach of Frashkard – the renewal of existence. Humanity chooses between the two ways in accordance with their free will. He is also known as Rigden Djappo – the Sovereign of Shambala. It is really interesting, isn’t it? 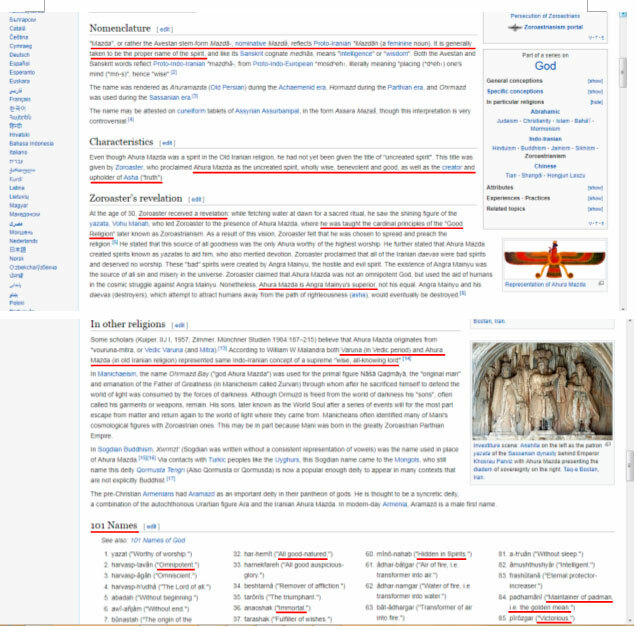 Surprisingly, Wikipedia preserves quite a lot of information about Ahura Mazda in its open archives, perhaps because the religion of Zoroastrianism has almost been relegated to oblivion and very few people today know anything about it. It has been especially pleasant to read the last line in the Russian version of the Wikipedia page dedicated to Ahura, where the latter is associated with Rigden Djappo, i.e. it is implied that these two Personalities represent one and the same highly spiritual Being, Bodhisattva. Well, now let’s supplement the information we already have with the information given in the books by Anastasia Novykh. Ahura Mazda is one of numerous names of Rigden Djappo. This is how Zarathustra called him. For you to know, in translation from the ancient Persian language Ahura Mazda means “the Lord of Wisdom”, or “the Omniscient Lord”. Later on in the Greek version the name of Ahura Mazda sounded already as Ohrmazd, Hurmuz or Hourmazd. In his homilies Zarathustra referred to Ahura Mazda as to the good principle resting upon the Spirit of fire and truthful order (Arta), possessor of the influencing word, the Wise One surrounded by a group of good ones, together with him making up the divine septenary of Amesha Spentas. Rigden: Certainly, any intelligent person, having compared this information, will understand that different “names” of God in religions are mere epithets of the One. For instance, let us consider the name of the supreme god of the ancient Egyptians – Osiris. This name is a Greek version of the Egyptian name Usir. That is, the Greek word Osiris is derived from the Egyptian U’sir, which means “He who is at the top”. Or, for example, what is the meaning of the name of the Avestan deity Ahura Mazda (later Ohrmazd, Ormuzd) in Zoroastrianism, proclaimed as the Single God by the Prophet Zarathustra? By the way, the prophet originally mentioned that the name of Ahura Mazda was just a substitution for the forbidden name of God, which none among people knew. This God was noted as Nameless even in the religious calendar. The Avestan Ahura Mazdā is translated as “the Wise Lord”, “the Master of Thought / Wisdom”. The Avestan word “maz-dā” also means “to keep in memory”. As a matter of fact, this “name” is derived from two ancient Iranian words having Arian (Indo-Iranian) roots. “Ahura” corresponds to the Sanskrit word “asura” meaning “master”, while “maz-dā” to the Indian “mēdhā” which means “wisdom, insight”. Rigden: ... Mentions of two ways of the Soul – the true and the false ones – exist also in the ancient Indo-European mythology. They have been preserved also in the Upanishads which are considered to be the final part of the Vedas, where the sacred knowledge and explanations of the secret inner meaning of the spiritual path are laid out. 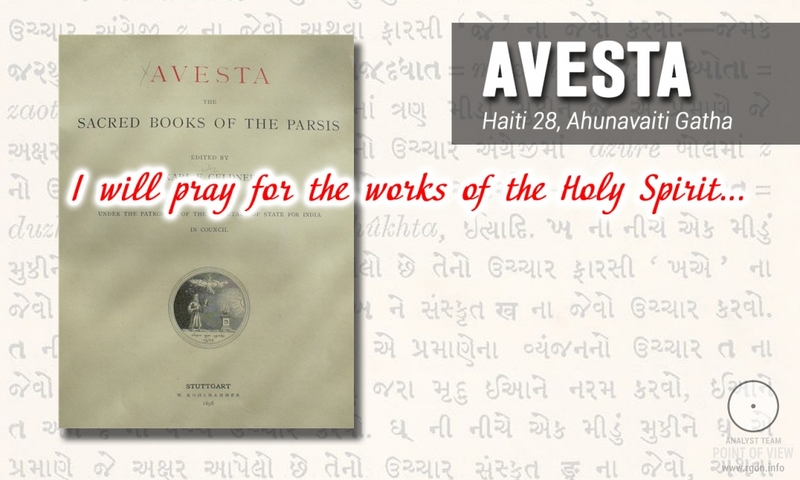 This work is the basis of orthodox religious and philosophical systems of India. The ancient Iranian religion of Zoroastrianism, the sacred book of which is the Avesta, also speaks about the personal Judgement of a human being after the death of his or her body. In particular, it is mentioned that the afterlife destiny of a person depends entirely on how many righteous good thoughts, words and deeds he or she has accumulated during one’s life. In three days after the body death, the human Soul goes to the Bridge of the Requital (Chinvat) for the Judgement executed by the sons of Ahura Mazda – Mithra, Sraosha, and Rashnu. The person’s actions committed during one’s earthly life are weighed on the scales by Rashnu (the spirit of righteousness; “direct, honest”). By the way, according to religious treatises, Ahura Mazda had four sons: Mithra, Sraosha, Rashnu, and Asha (the Essence of the Truth, the True Law of the Universe; the Asha term was also used in the meaning of the name of the goddess of Fate, Truth and Justice). Anastasia: In The Crossroads book, I wrote about the prophecies which are coming true today and existed among different peoples of the world: the Sumerians, the Mayans (Divination of the Bird Man), the Celts (divination of The Wheel of Times), the ancient Persians, and so on. By the way, the Persians in Zoroastrianism, too, like you’ve said, preserved a lot of information about the afterlife, the Resurrection, the common Judgment Day (Frashegird meaning “making (the world) perfect”). 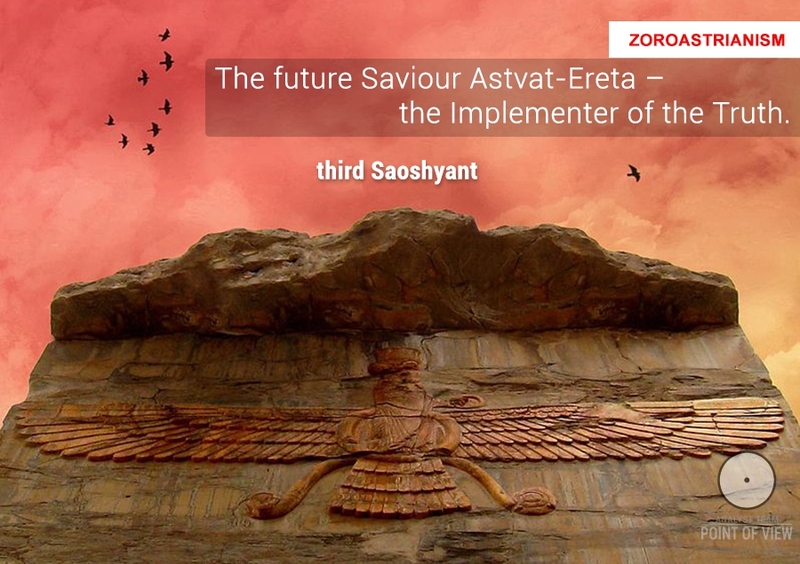 According to the beliefs of Zoroastrians, three Saoshyants are to come into the earthly world (“saoshyant” is an Avestan word, a participle of the future tense of the verb “to save”). The first two Saoshyants will have to restore the teachings of Ahura Mazda at the end of times, and then the last Saoshyant will come for the final battle with bearers of evil and execute the Last Judgment. There is also information that by the end of times, when the circle of millennial evolutions is exhausted (when Asha – Truth, Justice, Good – triumphs), “heaven on earth” can finally set in, where people will live happily: the earth will become like a valley; there will be one language, one law for all people. And every righteous person brings closer this event of the world’s transformation via one’s thoughts and deeds. From today’s perspective, all these predictions do not seem to be legends at all. The picture has become somewhat clearer, hasn’t it? Anyone who desires to know more now has relevant guidelines for the further search, and we should admit it is more obvious to us as well Who is in front of us. 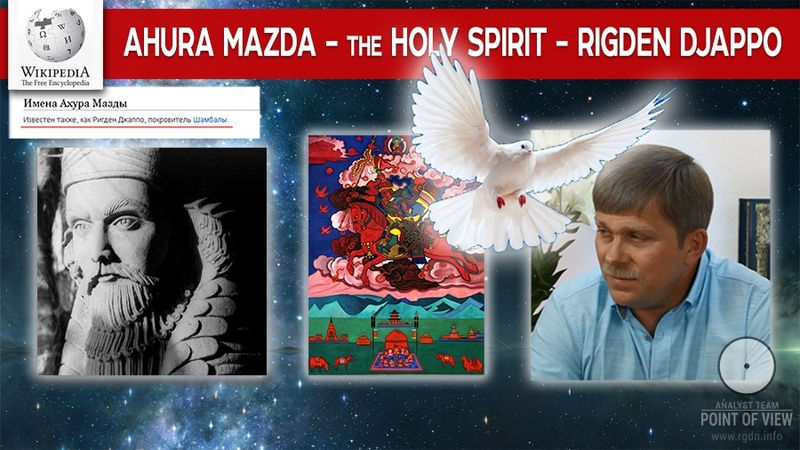 Ahura Mazda is one of numerous names of Rigden Djappo as Sensei of Shambala – Book IV says, and even Wikipedia calls Ahura Mazda the Holy Spirit. 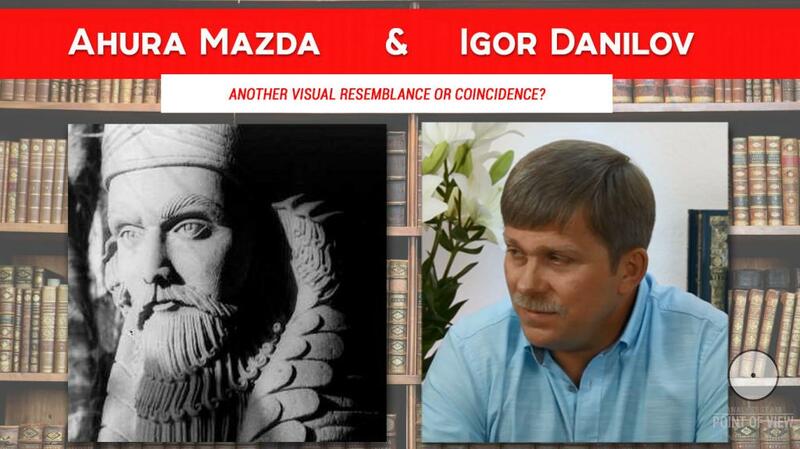 Moreover, it is interesting and appropriate to draw special attention to the Zoroastrian pair of “antipode deities” Ahura Mazda and Angra Mainyu who “oppose each other” within the “earthly project”. Consequently, associations with the following divine pairs automatically arise: Ridgen Djappo – Ariman / Ahriman (in Anastasia Novykh’s books), and (owing to some comments to the article Icon of the Mother of God “Softening of Evil Hearts”) such pairs as Horus – Seth (ancient Egyptian mythology) and Quetzalcoatl – Tezcatlipoca (ancient Mexican mythology). Finally, it has been unexpected to find out that Ahura Mazda was also believed to be the Lord of Justice, which in turn produces an association between him and Osiris, “the Judge of the souls of deceased”, who headed the list of preternatural beings of the ancient Egyptian pantheon.